I think an element should be named after Vasili Arkhipov (hope I got the right name - I just copied it from Wikipedia), the fleet commander who may have single-handedly prevented World War III by stopping a Soviet sub captain from launching a nuclear torpedo at the U.S. ships trying to force him to surface during the Cuban missile crisis (story just shown on Secrets of the Dead on PBS). This should be equally attractive to both U.S. & Russian researchers. Comments? I think chemical elements shouldn't be named after any person at all. Chemical element is not a memorial for but just a name of substance. Just imagine phrase "Arkhipovium hydride is very toxic and have highly unpleasant odor". I think Elerium is more sutable name for chemicle element, especially for 115. 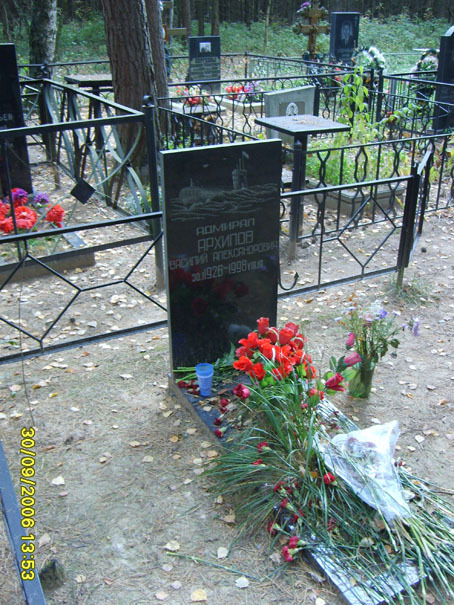 For memory of Vasili Arkhipov I put a photo of his monument. Elerium was used in a computer game about UFO's as a name for element 115. So I think that is out. At this point I think we need to go the route that GSI did for element 112 and look for important scientists in the physics domain who have made an important contribution, even if not in the nuclear physics field per se. At this point LBNL (Berkelium, Californium, Americium), GSI (Darmstadtium, Hassium, Germanium is old), and Dubna (Dubnium) already have elements names after their facilities/towns/regions/countries and key scientists (Seaborgium, Mietnerium, Flerovium).. Yes i know Flerovium was technically named after the Flerov region to avoid controversy but that was the intent of the name.